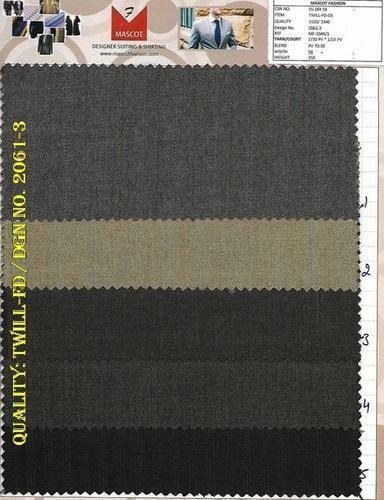 Our company is engaged in manufacturing, exporting and supplying of Twill Fabric Fancy (Serge). It is also commonly used for Thobe , Dasha , Galabiya , Kandura , Jacket , Trousers Suiting & School & Corporate uniforms. Fabric in various blends such as Polyester Viscose , Polyester Cotton , Polyester Viscose with Lycra , Polyester Viscose blend . We have huge collection in Design, Stripe, Check & Plain. We can make as per buyer’s requirement in various weight, blend, weave, finish & width. 6. Fabric available in variety of colors. polyesterviscosesuitingfab, polyvisfab, polyvisblendfab, polysuiting, poly kandura , thobe , galabiya. We, "Mascot Fashions Pvt. Ltd.", started in the year 2004 and have been ever growing since then as manufacturer, wholesaler and exporter of Suiting Fabric, Shirting Fabric, Uniform Fabric, etc. We have emerged as winners in the market by providing a wide variety of Fabric. Our products come with an extended life along with an unmatched quality that distinguishes us from our competitors in the market. Our never ending commitment towards qualitative approach earned us a rich client base in the testimony of our market standing.